One great feature of the Volunteer Calendar is that we allow your volunteers to take ownership and get their own substitutes for times when they cannot meet their commitments. Be sure that the Email Reminder for the volunteer org includes a Register Link, as the volunteer will use this when needing a sub. 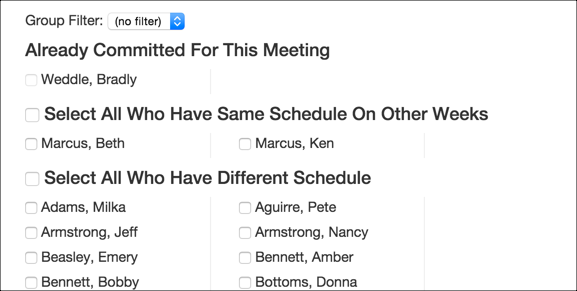 A volunteer will access the Manage My Commitments page by using the Register Link in the Email Reminder or their original Confirmation Email for that org. 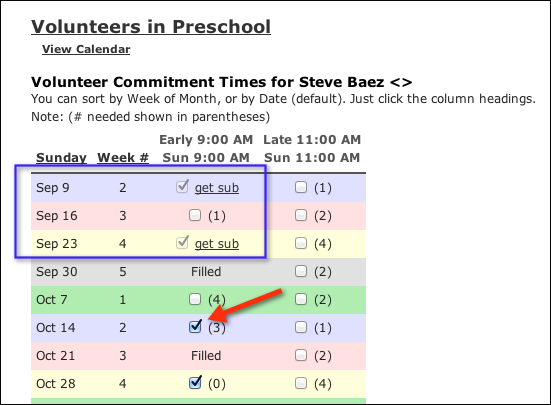 Once on that page, the volunteer will click the Get Sub link for the time slot for which they need a substitute. Notice in the image that Steve must get a sub for the 2 Sundays in September, but could uncheck the weeks after that. That is because the Lock Out Days for this org is set to 21. Anything after the 21 days he can manage himself without having to get a substitute. Some churches choose to have the lockout days set to 365, this requires that someone must always get a sub instead of just changing their commitments. Clicking Get Sub will open an email like the one below. Notice that the Subject is clear, using the name of the volunteer org. Also, the body of the email gives them two options: Yes, I can and Sorry, I cannot. Below the email itself are options for selecting recipients. The volunteer will select those that he wants to receive the email. He will not be able to select a volunteer who is already committed for that time slot. 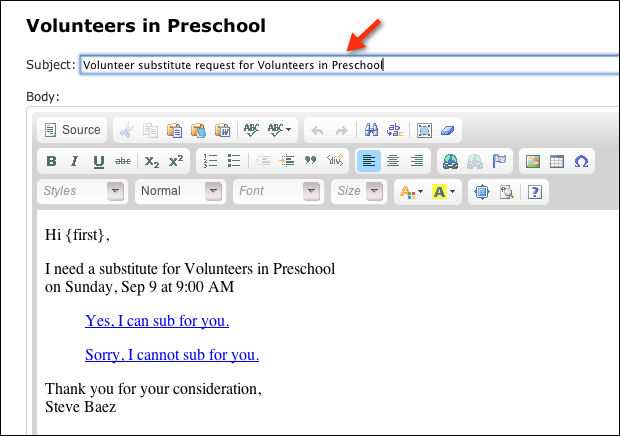 After making any revisions in the email, such as a reason he needs a sub, the volunteer will click Send Emails . He must not edit the two options (Yes and No), as those contain links that allow the recipient to respond. 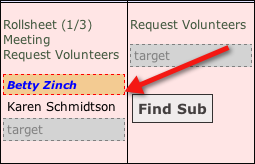 Both the person requesting the sub as well as the leader of the volunteer org will receive an email with a link to the Substitute Status Report , where they can track the responses. As soon as one person responds “Yes” the tracking will indicate who has responded. Anyone else responding “Yes” will see the message “The slot has been filled”. Here is what the Volunteer Calendar looks like when a volunteer has requested a Sub, but the time slot has not yet been filled. Note that there is a red dotted-line border around the name of the original volunteer and the name is in bold blue. Also, if you hover over the name, Find Sub displays. This is to let you know that a sub has been requested. After a sub has been committed, here’s what that same time slot looks like. Notice that Betty’s name is marked through and the subs name is added. Also, note that the sub’s name is in green type. This lets you know that person is filling in that week. TouchPoint has three emails related to Volunteer Management that have system default text. These are not included on the Messages Tab of the org; however, your System Admin can customize these if you want. After each one has been sent for the first time (this should happen during your testing), these files will get added to the Special Content > HTML Content on your database where your System Admin can edit them. These are for used all the Volunteer Calendars in your database. You must enter the text for the Confirmation Email and the Reminder Email on the organization itself, on the Registration > Messages tab. There is no default text for those. Be sure you include a Register Link in each of these. This is the email sent when the calendar manager sends a request asking more volunteers. This is the email a volunteer will send when he needs to request someone to substitute for him on a specific date and time. In Special Content, your System Admin can edit the email to say what you prefer. However, the volunteer himself can also edit the email just before sending it if he wants to include the reason why he needs a substitute. He should not remove any of the replacement codes used for the response options. This is the confirmation email sent to the person that has accepted a sub request. Please note the specific email replacement codes in each of the emails. These are very important as they contain the information the recipient needs to know.